Given the good Mr Zimmerman is presently knocking on the door of his three-quarter century (75 to you and me); I felt I really should make the effort to catch him in concert before one of us dies. Me, from my chocolate-rich diet and sedentary lifestyle, or He from the stresses and strains brought on by the rigours of The Never Ending Tour – which, by all accounts appears to have been ongoing since 1988. There were a mind-boggling 92 shows last year alone, but the man does appear to be slowing down a touch – this being only his 64th gig of 2015! Perhaps a factor in the apparent slowdown was the fact he had to take some time out to record his most recent album: Shadows in the Night – a collection of Frank Sinatra covers. I shall perhaps state that once more – a collection of Frank Sinatra covers! Yes, one of the most influential songwriters of the 20th Century, who cannot sing for toffee, has recorded a set of songs made famous by one of the finest singers of the 20th Century, who co-incidentally could not have written a decent song to save his life. And Dylan was certainly punting the collection this evening, for we were treated to five songs from the album. And just in case we failed to notice where Bob’s heart lies these days, a further two Sinatra standards which had failed to make the cut were also aired: Melancholic Mood and All or Nothing at All. The last named was an acceptable performance, but with the remainder Bob just gurned and groaned his way through these classic songs, doing a great disservice to each in turn. Fortunately what these interludes did have going for them was brevity. Having said that, betwixt and between all the Frankie-worship there was in fact some rather enjoyable stuff. The opener Things Have Changed, which although perhaps sounding a bit too much like a cross between Road to Hell and First We Take Manhattan, rattles along in fine style. It’s world-weary lyric possibly intended to act as a counterpoint to his seminal The Times They Are a-Changin’. Well they have now changed and Bob no longer cares, apparently. Duquesne Whistle was another fun ride, even if Bob probably quite wisely chose to forego attempting to replicate his Louie Armstrong impression from the studio version, instead deciding to sing in the manner of…..well, Bob Dylan. This song was one of five from 2012’s Tempest collection, the pick of the bunch being the lengthy Scarlet Town, an epic bristling with vaguely biblical imagery. All of which, as simple arithmetic would attest, left precious little room for much in the way of “Greatest Hits”. She Belongs to Me was trotted out early on, but the highlight of the first set was, perhaps unsurprisingly, Tangled Up in Blue; Bob enjoying great fun fiddling around with the lyric as has become his wont. Not least in changing the narrative perspective from first to third person. But the funeral-paced rendition of Blowin’ in the Wind played as the first encore really was hard work to sit through. Due to the Camera Police being out in force at the RAH decent pix were at a premium. Here I just managed to catch Bob strolling off past Charlie Sexton and Donnie Herron. So that was Bob. And how was Albert? Well, I think my impressions were at least moderately skewed by the fact I had attended both Wembley and Twickenham a few weeks back, but I was surprised how bijou and compact the Albert Hall is. 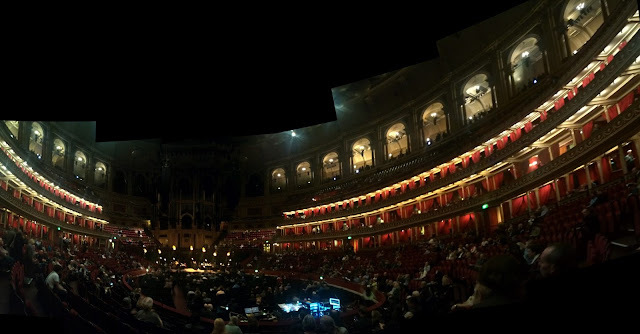 There are only around a dozen or so rows of stalls around the main auditorium, and that central area (seated this evening) where during The Last Night of The Proms idiotic Hooray Henrys and Henrietta’s bob about like lobotomised Clangers’ Froglets is a deceptively small space. What Albert does enjoy though is height, lots of it - housing at least three rows of private boxes, with a lofty standing gallery above. Clearly this was a venue built to ensure the cream of London society could enjoy their entertainment without having to mix too much with the Great Unwashed. Everyone's got their own opinion. 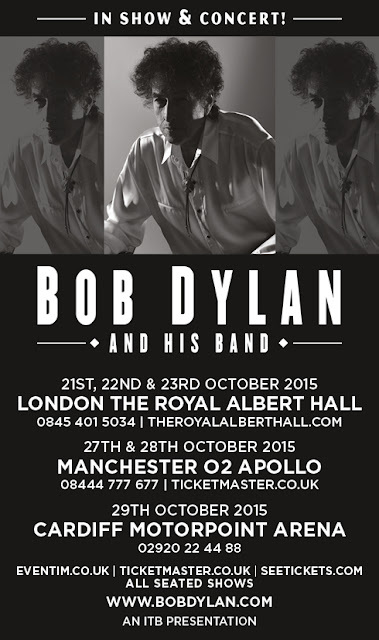 Go to a Dylan show and you'll hear some people say they are mad that Dylan didn't play "their" favorite Dylan tunes. Or people don't understand that Dylan rarely plays the songs exactly the same as originally recorded and this has been a standard procedure for over 20 years. Some people don't want to hear the new standards songs, etc. Or they'll say Dylan's vocals were horrible, even though this depends on the venue and not Dylan. Go with an open mind and you'll have a great time. Go with preconceived notions on how the songs will sound and be played, and refuse to accept anything else, then you probably shouldn't even be going to any live concerts by any musicians.